What If The Other Driver Said That You Ran The Red Light? Imagine that you have been in a car accident caused by the negligence of another driver who violated a stop light and ran into the side of your car. The impact of the collision was severe and you suffered personal injury. You assume that there will be no problem collecting for the damage to your car as well as your personal injuries. Then the insurance adjuster calls and tells you that the liability insurance company for the negligent driver is not going to voluntarily pay one dime. The driver of the other car said that you were the driver who ran the red light and that when he went through the intersection, his light was green. How Is This Matter Resolved? The situation described above involves a serious conflict in the evidence. You will testify that you had the green light and that the other driver had the red light. The other driver will testify to just the opposite. How is this matter resolved? In situations where there is a strong conflict in testimony, cases can still sometimes be settled. If there are independent witnesses to the collision, their testimony will be crucial. These witnesses, who have no ax to grind, will be given special attention by both parties. These independent witnesses will be credible since they do not have a "dog in the fight". Conflicts such as this can sometimes be resolved by an accident reconstruction engineer who will examine the scene of a collision and form opinions about how the collision occurred. However, nothing is as strong or convincing as eyewitness testimony. In the end, if the parties cannot agree before filing suit, a lawsuit will be necessary to resolve the conflict. If an insurance company makes an offer to the injured party in this situation, the injured party would be well advised to consider settling the case for less than it would be worth if the defendant's liability was clear. It would be wise for the injured party to take into consideration the very real possibility that if the case were tried, the jury could find for the defendant and not award anything. In trials involving such a sharp contrast and conflict in the testimony, the case is decided by the court if no jury has been requested. 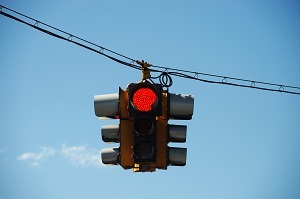 If a jury has been requested then a jury will decide the factual issue of who ran the red light. All the witnesses will testify and tell their version of what happened. It will then be up to the judge or the jury to determine who is telling the truth. Let's assume that there are no independent third-party witnesses and that the only two eyewitnesses to the collision are the two drivers, the injured party and the defendant. Each party will testify and will subject to cross-examination. A lot will depend upon the credibility of the witnesses. Do they seem believable and truthful? Are they candid and forthright in their testimony? What is their body language? What type of impression do they make to the finder of fact? After all the evidence is in the finder of fact, either the judge or the jury will have to decide which driver is telling the truth and which version of the events are true. Of course, the finder of fact can rule either way. The decision of the judge or the jury on this factual issue is not appealable. The injured party who brought suit has the burden of proof. Because of this fact, the chances of the plaintiff winning are less than 50/50. That is because the plaintiff, injured party, has the burden of proof. If the finder of fact, after hearing all the testimony, is unable to determine who is telling the truth then the injured party loses. This is true because the injured party has the burden of proof. If the finder of fact cannot make a decision, the plaintiff, injured party, has not met his or her burden of proof and will lose. When deciding to settle a lawsuit, the injured party must consider the liability aspect of the case. That is, the injured party must be realistic and recognize that if the evidence is conflicting, they could lose. Because of this fact, it is in most cases in the best interest of the injured party to settle their claim for less than it would otherwise be worth if there were no issue of liability. Where there is strong evidence both ways, the injured party would be well advised to accept a lesser settlement.